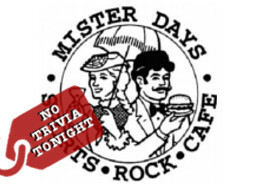 Unfortunately, there will be not trivia tonight (3.28) at Mister Days in Clarendon, due to the NCAA Tournament. We'll see you back next week! For your trivia fix in the meantime, listen to the We Don't Know Either podcast!